So, this isn’t strictly a sewing post, but I hope you’ll find it interesting nonetheless. It sort of ties in with the Wardrobe Architect posts that Colette have been running recently (and which I mean to work through as soon as I have a bit more time!). A few months ago, I got a call from my sister at lunchtime, saying that she’d had an idea of what we could get our mum for Christmas. Her idea, and it was a brilliant one, was for the three of us to go to a colour analysis session together. The owner of a salon my sister used to work at had talked to her about it before, and recommended a consultant to her, and I remember my dad saying on a number of occasions how my granny had had it done years ago, and he thought that she always looked great when she wore the colours that she should. A friend of mine had also had a mini session recently, and raved about it, so I thought it would be a great thing to have done. Since I’ve started sewing, I’ve started thinking a lot more about style, and what sort of things suit me, so I was hoping this would add to that. 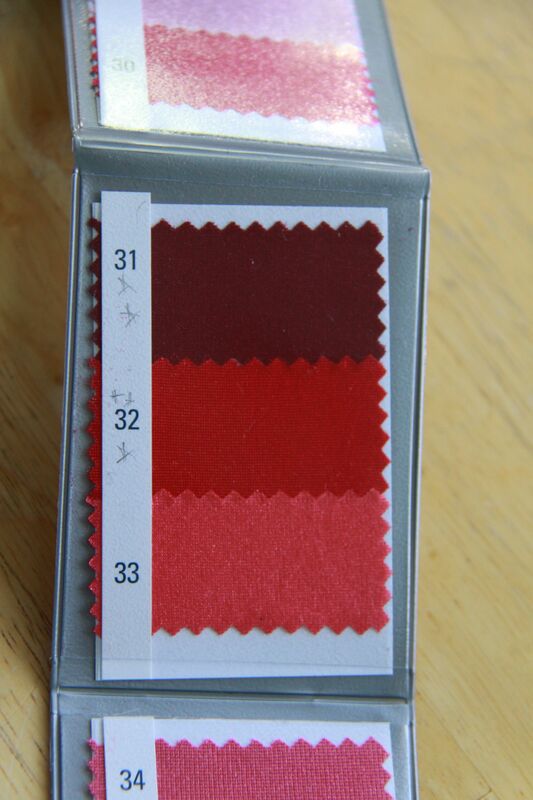 Knowing what colours I should be looking for when I’m buying fabric would be really helpful, and also probably cut down on the amount of fabric I buy just because I like it, when it might not actually particularly suit me. The consultant who had been recommended to my sister was Lisa Whiteside, a House of Colour consultant who happens to be based near Oxford. So we booked in for the three of us to go along for a colour analysis class in January. Unfortunately I didn’t get any pics throughout the session – I really wish I had, but I think my sister would probably have disowned me had I dare to put a photo of her without make up on on my blog! 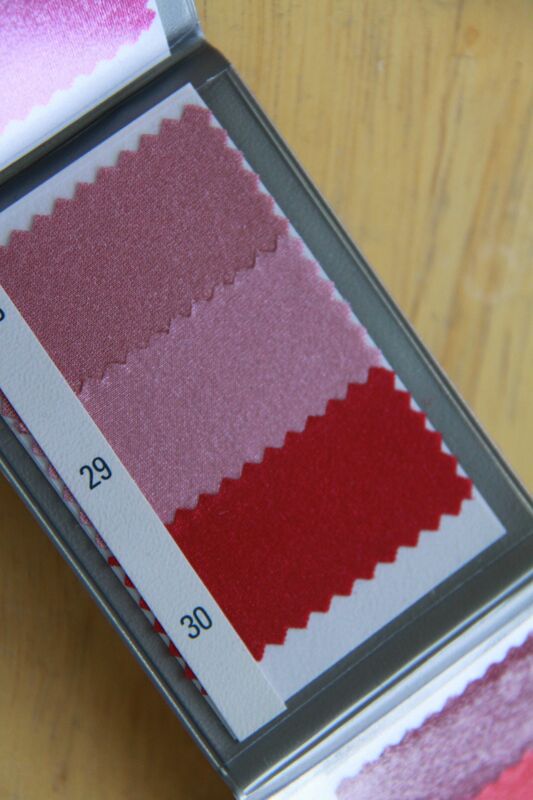 Number 5 (musk pink) was one of the colours which looked especially good in. The double starred colours are the best ones – the ones that you could wear head to toe and look great in. For those of you who aren’t aware, the idea behind colour analysis is that everyone has unique skin tone and eye colour, and this affects which colours look great on you, and which don’t look so hot. House of Colour explain it in more detail here. 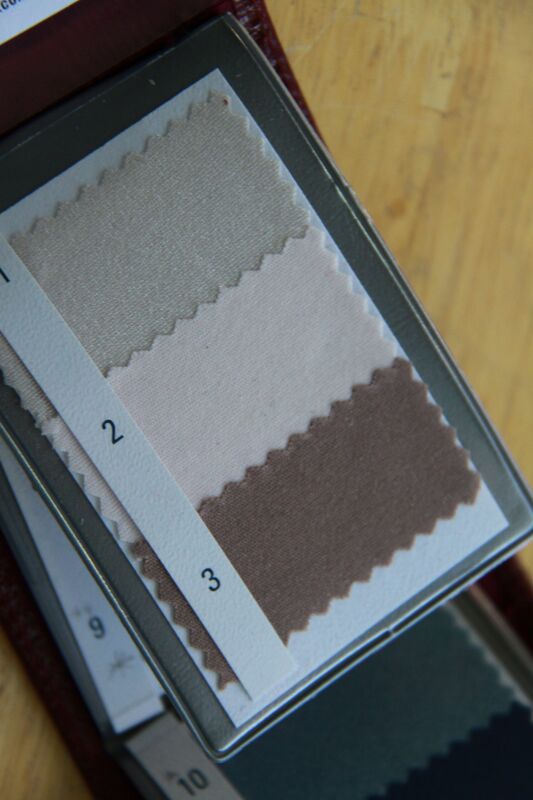 The colour spectrum is split into four ‘seasons’, and the consultant will work out which season works best for you, and then classify the colours within the season to tell you which ones work best. Establishing which season you are is done by using a number of coloured drapes. You need to do it with no make up on, and your hair and top will be covered up with white as well, so that you’re essentially a blank slate, and it’s easier to see how the colours work. While you’re sitting in front of a mirror, the consultant will stand behind you, so she can wrap the drapes round your neck. They start with a couple of ‘base’ colours, which will determine if the more blue based colours (winter and summer), or the yellow based colours (autumn and spring) work best with you. 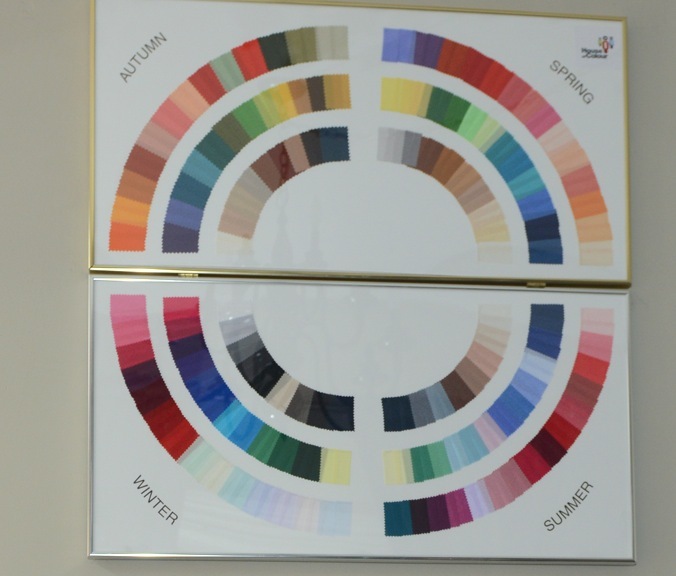 Once they’ve established which half of the colour wheel you fall into, they then use the drapes in pairs, using two very similar shades, but one from each of the two different seasons in your half of the wheel. She will put one on you, then the other, and decide which one looks best of the two, viewing each a few times if necessary. It’s fascinating watching it done on someone else, as it really is obvious which ones look best on them. It’s much easier to see it on someone else than it is to see it on yourself. You might not have noticed that a particular colour works really well on them, but when you see it next to one that doesn’t work so well, I was surprised at how noticeable it was. My sister went first, and she fell into the yellow half of the spectrum. She turned out to be an autumn, and the olive green and rust and coral colours really did look absolutely stunning on her. With a few of those draped round her neck, you could really see how well they not only went together, but how much they suited her as well. For the sake of comparison, my sister. Who will probably hate me for including this photo, sorry Roz! Next up was my mum, who fell into the other half of the spectrum, with the blue based colours looking better on her. After going through the draping process with her, we established that she was a summer. 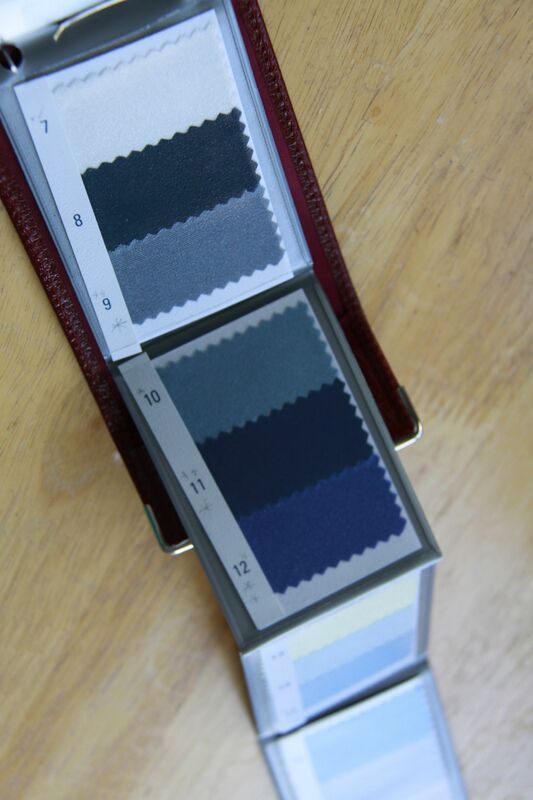 The summer colours are the more muted of the blue-based colours; the winter colours are much more vibrant. Again, we were all amazed at the difference it made, and how good some of these colours looked on her. Finally it was my turn. Often, you will share the same season as family members, so it was going to be interesting to see if I matched either of the other two. As seems to be my style, I turned out to be a bit more of a challenge, and it look Lisa a little longer to establish whether I looked better in the blue- or the yellow-based colours. 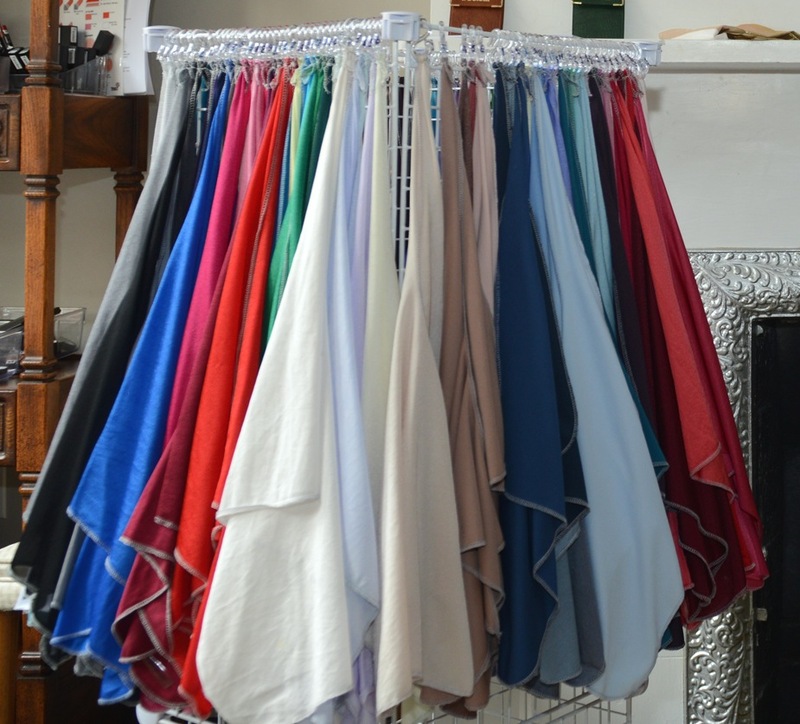 Eventually we settled on the blue-based ones, and went through the draping process again. I turned out to be a summer as well, taking after my mum. 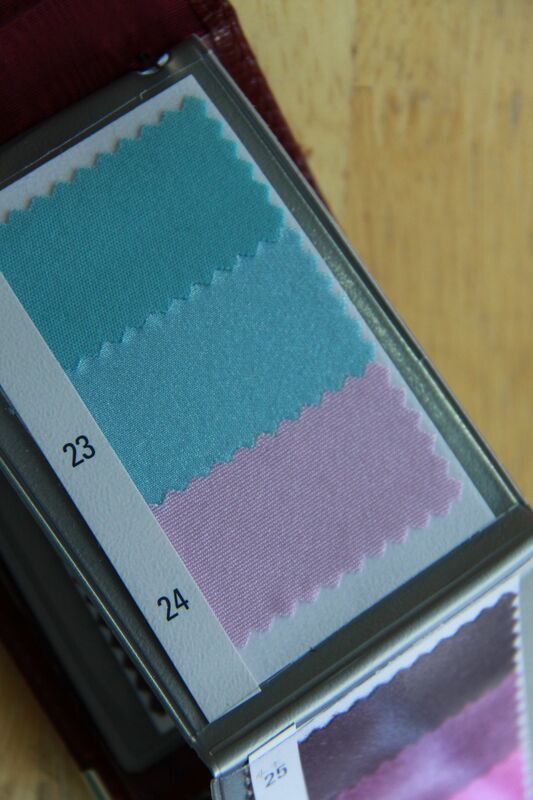 22 (duck egg) and 23 (pastel aqua) – some of my favourite colours to wear – I’m glad they are in my palette! After we’d all had our seasons established, we also looked at some of the make up that suited our colours, and then moved on to look at the colours in more detail. In this part, Lisa again held up each of the drapes in our season against us, and rated them, depending on which she thought looked best. And again, I was surprised at how easy it was to see what she meant. A colour that had looked great when you were comparing it to one from a different season suddenly didn’t look quite so great when you compared it to one that really did look amazing. She went through each of the 30-odd drapes, giving us a rating for each one, and whether it was a colour we should wear an entire outfit of, or one that was better as just a top, or just worn below the waist. This section was interesting as, although my mum and I had come out the same season, the colours that looked the absolute best on each of us differed – the paler of the summer shades looked best on my mum, while some of the darker ones suited me better. As you can see, most of my top rated ones tended to be the darker shades, like 31 (burgundy). 32 (cherry) also came in pretty highly. 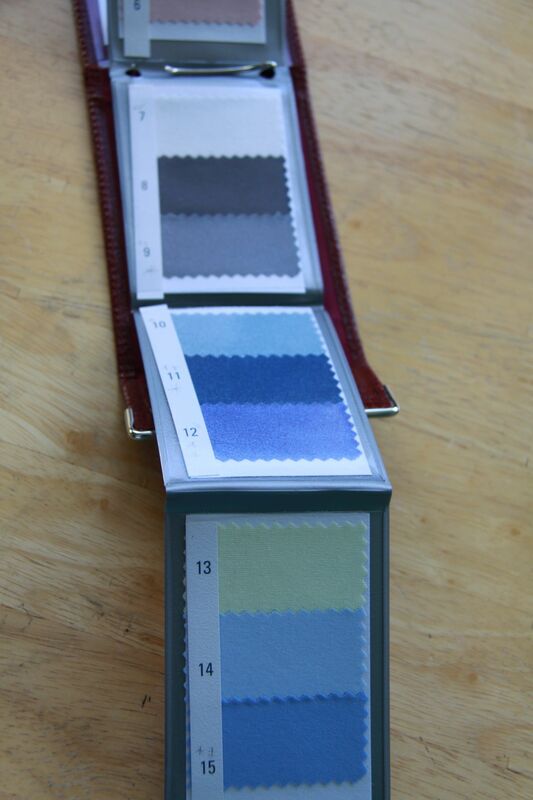 You get a wallet to take home, which contains 36 swatches of the colours of your season. 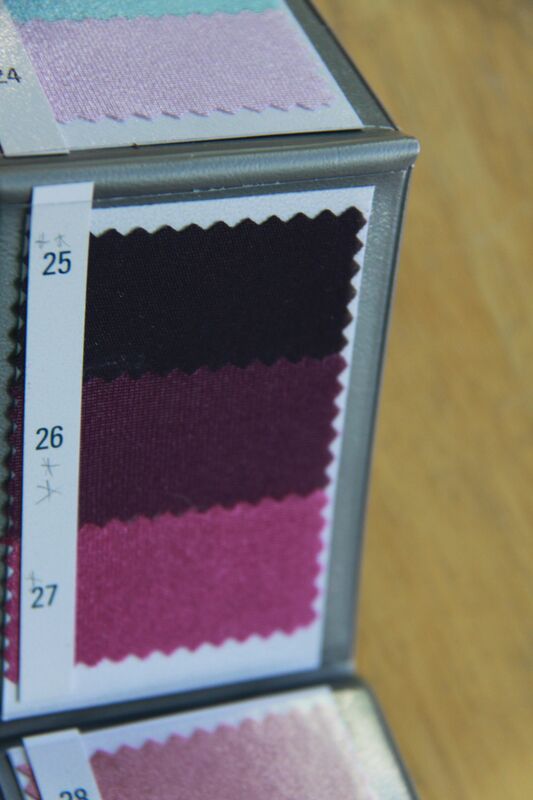 They are quick to point out though that your colours aren’t just those 36 colours, but a quarter of all colours – when buying clothes (or fabric!) 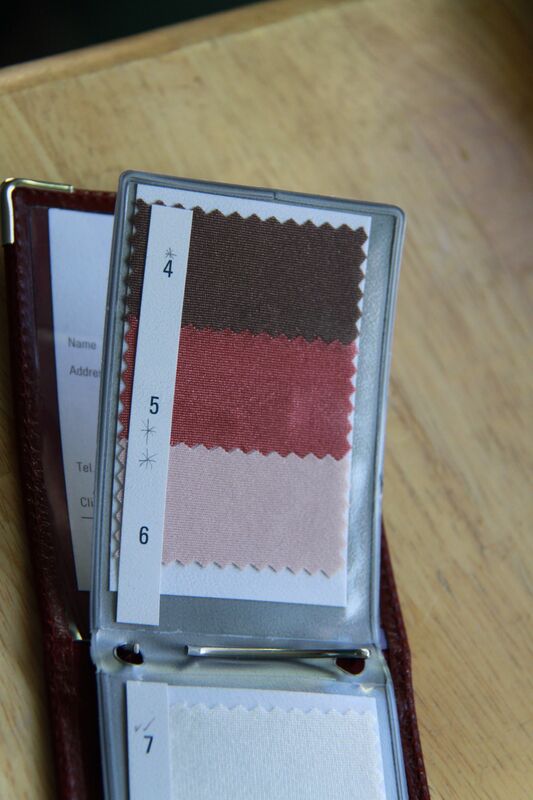 you don’t have to stick just to those colours in your wallet, but should be looking for colours which fit into that colour palette. I found the whole day really interesting and enlightening, and we all really enjoyed it. I would thoroughly recommend it to anyone. It’s certainly made me think more about the colours I wear, and has made me pause before buying clothes or fabric. It makes you suddenly realise why an item of clothing you love on someone else and go out a buy might leave you feeling disappointed when you put it on yourself. I still need to go through my wardrobe and sort that out into things which are ‘my’ colours, and things that are not, and then eventually get rid of most of the things that are not, but that is a challenge that I’m not quite ready to take on yet. One of the most challenging things will be cutting out black (winter is the only season in which true black appears), and replacing it with other neutrals such as navy and grey. Not because I love wearing black, but just because it’s so readily available, whereas other colours might not be so much. I think that this is where being a sewist will come in really handy – as people who make our own clothes, we’re not restricted by what colours the fashion industry decides are ‘in season’ and limited to those when we shop. 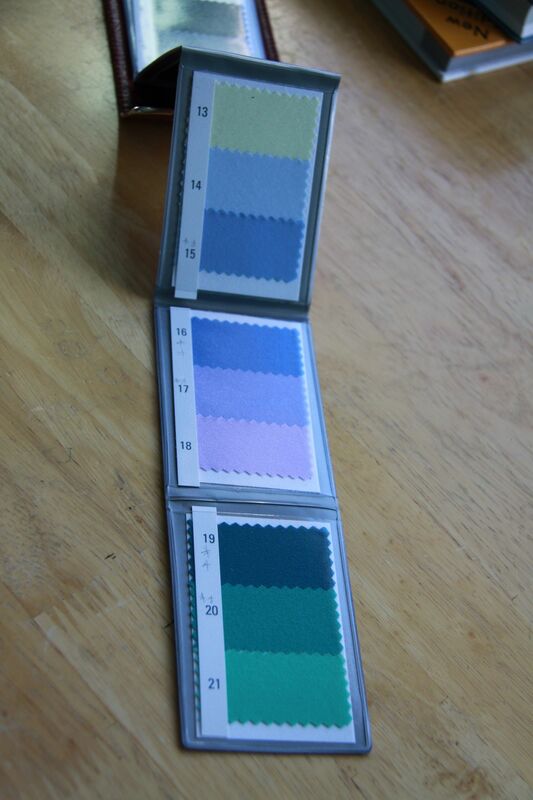 I’m pretty sure I could go out at any given time and pick up more than enough fabrics that are in my colour palette. It’s also made me realise which colours I don’t wear much of, and probably ought to try a bit more often – I don’t wear a lot of pink at all. I don’t know why. I was never really a ‘pink’ kind of girl, and it’s often deemed as such a girly colour, that because I didn’t love it, I just tended to avoid it completely. 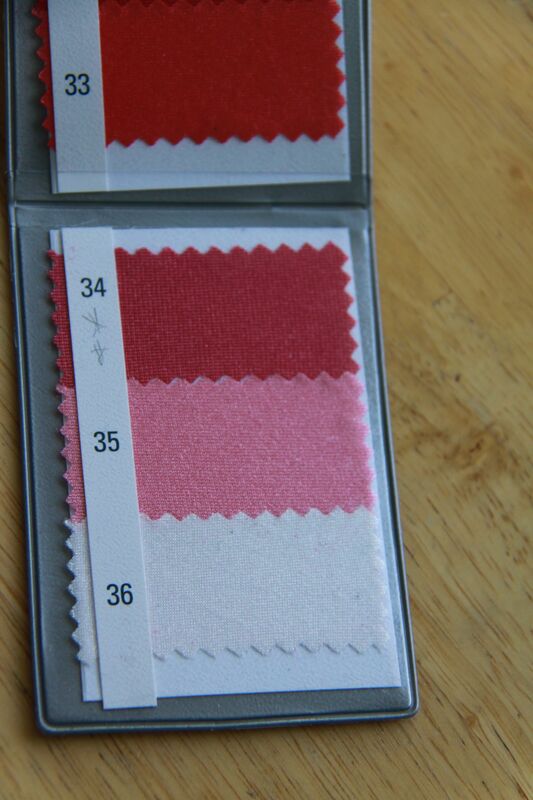 But there are a lot of different shades of pink in the summer palette, some of which looked great on me, so I’m definitely going to try and include it in my wardrobe more. I have made some changes already though – I have ditched my black eyeliner and mascara in favour of navy, and, on the first day I wore those, about 3 people commented on my make up looking nice, so it does seem to work! I am certainly thinking more carefully about what I wear now, and I just need to start sewing myself up a wardrobe in my correct colours!